4 Ways To Get The Design You Want | Sharp Innovations Blog | Sharp Innovations, Inc. When you’re getting ready to make a new website, you can take some important steps to ensure that you’re happy with the design that your developer creates for you. Here at Sharp, our designers will always try to incorporate your vision as we see it while still implementing general rules of good practice in the world of the web so that you get a website that matches your vision and works efficiently for your customers. Things like button placement, color palette, fonts, iconography, photos, and so much more are all important decisions that go into an initial website design. Merging these deliberate decisions with what you have in mind is a careful balance that can sometimes result in something unexpected without a lot of detail. 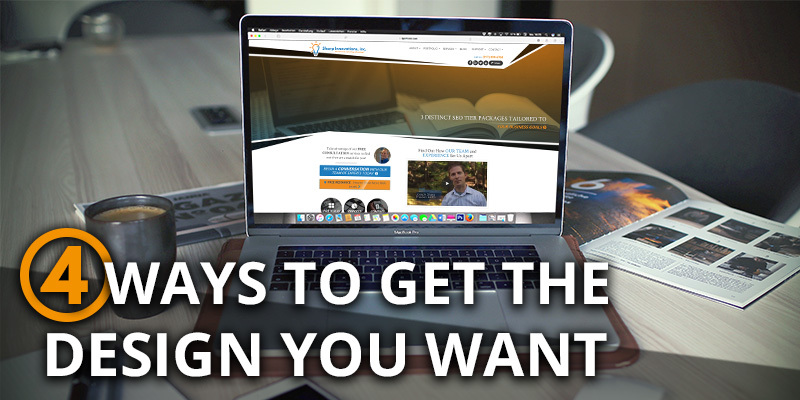 Some people like to be surprised and allow our designers as much creative freedom as they want, but if you have a particular vision of how you want your new site to look, here are 4 ways to get the design you want. 1. Provide as much detail as possible. If you have a very specific vision, be sure to communicate it as clearly as you can. The more detail you give us, the closer we can get to your vision. To you, that vision can seem obvious, but we may have a very different picture in mind if you don’t provide us with copious descriptions of what you’re looking for. So tell us every little thing. For a web designer, there is no such thing as too much detail! 2. Listen to your designer. Keep in mind that we want to create something that looks great and works well for you! A great way to ensure that you get an effective, beautiful design is to heed your designers’ advice when they offer it. They will utilize their experience, industry standards, and creative freedom to produce something original but sensible for visitors while they also adhere to good SEO practices. If your designer pushes back on a request, remember it is in your favor to consider it. Your designer will always have your best interests at heart, and if you are adamant about something in particular, we will do our best to implement it into your design in a way that benefits you and your visitors the most. 3. Provide imagery. The Internet is a visual medium, and photos have a significant impact on the overall appearance and effectiveness of your website. If you have your own photos or can supply stock photos that you already like, it will increase our ability to create a site that matches your vision. If you can’t provide photos, we will choose stock photos that we feel fit the design best, but we have learned that it is very common for clients to dismiss a particular design based solely on the photos chosen. Photos can always be swapped, but having the right photos to choose from at the start can influence your opinion of the design as a whole once presented. 4. Be patient. If we can’t nail down a design that’s right for you on our first try, know that we’ll work with you until we do. Design is an extremely subjective thing that can be difficult to get right the first time around. Most designs require some level of revisions to get just right, so it’s important to be willing to work with your designer. The design that you finally choose is probably going to be the online face of your company for good, long while, and we want you to be happy with it! Our designers love what they do and enjoy producing unique, elegant layouts that set your business apart from others. Whether you have a specific vision for your new website or you want us to create something brand new, following these suggestions is a great way to ensure you get something beautiful and effective! Posted in Website Design and tagged SEO, stock photos, website design, website layout on February 14, 2018 by Greg Lauver . Are Outdated SEO Tactics Sinking Your Website?